Take the Eisenhower Expressway and exit at Austin Ave., going north. 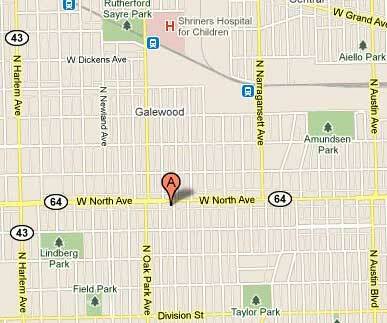 Turn left on North Ave. We are right pass Oak Park Ave. Parking is free if you park behind our building in the parking lot. There is also metered parking on North Ave.
Exit train or El. at Oak Park Ave. Lake St. stop. Exit station from north doors. Proceed north heading down to North Ave. make a right and we are just steps from Oak Park Ave. and North Ave.
Take a North Ave. bus and get off right in from of our building a few steps pass Oak Park Ave. Call CTA for bus schedules and directions. *This map is informational only. User assumes all risk of use without representation or warranty. Google Maps and their suppliers assume no responsibility for any loss resulting from such use.